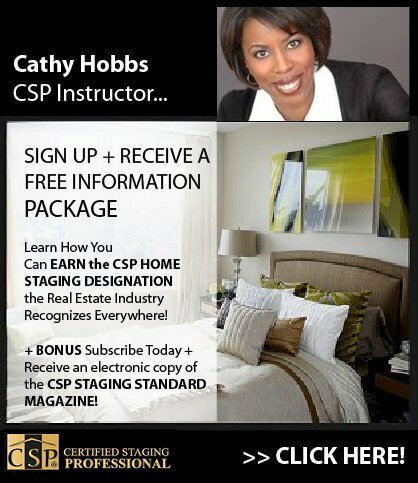 LAS VEGAS HOME STAGING COURSE: CELEBRITY INTERIOR DESIGNER NYC HOME STAGER CATHY HOBBS OF HGTV DESIGN STAR TO TEACH (CERTIFIED STAGING PROFESSIONALS) COURSE FEB 4-6 2012 IN LAS VEGAS!! ≈ Comments Off on LAS VEGAS HOME STAGING COURSE: CELEBRITY INTERIOR DESIGNER NYC HOME STAGER CATHY HOBBS OF HGTV DESIGN STAR TO TEACH (CERTIFIED STAGING PROFESSIONALS) COURSE FEB 4-6 2012 IN LAS VEGAS!! I am pleased to announce that in addition to being the keynote speaker at the upcoming RESA (Real Estate Staging Association) NATIONAL CONVENTION I will be teaching the 3-day Home Staging Certification course offered through Certified Staging Professionals (CSP) February 4-6, 2012 at Treasure Island Hotel and Casino in Las Vegas Nevada. If you are looking to become a professional home stager this is truly the course for you. This course provides everything you need in order to start, grow and build a successful home staging business! 75%+ or higher grade on exams (including practical assessment). 6 weeks (12 -1hr sessions) Marketing Advantage Camp– Students receive marketing & business guidance from a LIVE Marketing Coach through this six consecutive week marketing camp. Students register for a live webinar (coaching is online, student only needs a computer with speakers to attend!) as they are taught marketing strategies to help them attract clients. In this economy it is more important than ever for home sellers to be able to sell their homes without spending a “bundle”. “Shopping your home” can be a feasible alternative for those looking to stage on a budget. As home staging always means highlighting the positives and downplaying the negatives, the overall visual presentation is key. Because many homes that are staged are owner occupied, a stager will either ask the home seller to remove a number of pieces in order to rent, or in some cases purchase, replacement furnishings. Or, what happens more often in this economy is to use furniture a home seller already owns. I call the process “shopping the house” when I set out on a treasure hunt to see what items a homeowner may have hidden in a closet, attic, or in simply another room. It may be hard for home sellers to “re-imagine” their home using items they already own, which is where a Certified Staging Professional comes in. Recently, while teaching the three-day Certified Staging Professionals course in Arlington, Va., my students and I executed a dramatic before-and-after transformation without spending a single penny! Before the staging, an attached home in Arlington (a suburb of Washington, D.C.) was lingering on the market. Upon entry, I quickly noticed a home that was full of “stuff” but void of life. There were rooms with no clear function, some used as storage areas and poorly laid out. In “shopping the house” we first went in search for large attractive furniture items we could use to create a solid floor plan and flow, and then from there fill in the gaps with accessories and artwork. We also wanted to make sure each room sent the message of being functional and spacious. As all of the walls in the main living areas were white, we wanted to create a neutral color palette in order to appeal to the largest amount of potential buyers while also adding a sense of vibrancy and color to the space, which we did using artwork and accessories. the house” not only saves money but can truly be an opportunity to refresh and renew. My approach to interior design and home staging is based on my overall design vision and philosophy behind my brand design recipes, determining how a potential user needs to live and function in the space, while also creating an environment that is aesthetically pleasing and appeals to the largest audience. Five-time Emmy award-winning television personality Cathy Hobbs is the founder of Cathy Hobbs Design Recipes™, a New York City-based firm specializing in interior design, home staging, and home-staging training. A nationally known design expert, Cathy was a finalist on Season 6 of HGTV’s hit reality series Design Star. Cathy is currently traveling around the country as an instructor for Certified Staging Professionals, teaching their prestigious three-day certification course. www.cathyhobbs.com. LAS VEGAS HOME STAGING COURSE: BECOME A REAL ESTATE STAGER (CERTIFIED STAGING PROFESSIONALS) CLASS FEBRUARY 4-6 2012 IN LAS VEGAS,NV! ≈ Comments Off on LAS VEGAS HOME STAGING COURSE: BECOME A REAL ESTATE STAGER (CERTIFIED STAGING PROFESSIONALS) CLASS FEBRUARY 4-6 2012 IN LAS VEGAS,NV! I am pleased to announce the addition of teaching the prestigious 3-Day Certified Staging Professionals home staging course at Las Positas College near San Francisco, California to my teaching schedule. Three classes scheduled between now and October beginning in April! 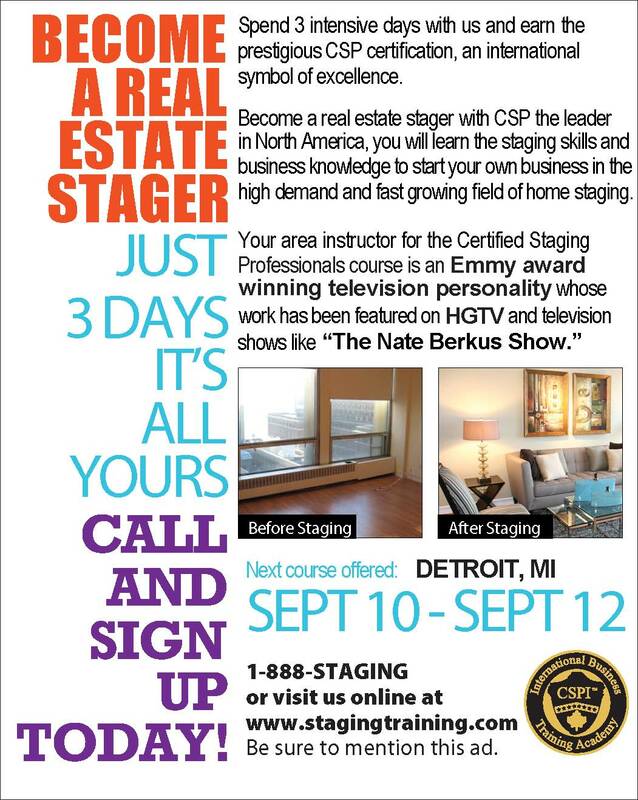 Contact 888-STAGING or http://www.stagingtraining.com to learn more! Uncovering the architectural “bones” of a space is the key to design and staging success. As an ASID Interior Designer and Certified Staging Professional (CSP), with years of education and experience under my belt, I approach each staging as a challenge in design. My “design recipe” is to always sift through the clutter, ignore the obvious flaws, and uncover the hidden real estate gem that I know lies beneath. Many folks also know me as an interior designer and television personality from such programs as The Nate Berkus Show and HGTV’s Design Star. My approach to staging and design is indeed rooted in always paying attention to the visuals while also incorporating design elements such as function, which I believe is the key to successfully selling real estate. If a potential buyer can’t see the beauty of a space, it’s game over. One of the more challenging stagings I have experienced really put my design skills to the test. Broker Scott Harris of Brown Harris Stevens, after trying unsuccessfully for 6 months to sell a 7-room, 3-bedroom, 3.5-bath with maid’s room on the Upper West Side, hired me and my team at Cathy Hobbs Design Recipes. To say that the apartment lacked show appeal is being kind. Knowing the challenges of the current real estate market, Harris put the property on the market as soon as the seller was ready, despite the property still being occupied by renters. There were no takers. Despite the hidden positives, the apartment had numerous, obvious negatives. The whole apartment needed a makeover, from a living room that was full of mismatched and unattractive furniture, to a dining room that was used as a makeshift office, a messy maid’s room, and other bedrooms that were dingy and full of clutter. On top of it all, potential buyers felt that they were in a time capsule that was stuck in the early 80s. I was brought in with the hope I could deliver a real estate resuscitation. The apartment had gorgeous original details, such as 1930s doorknobs, bullet hinges, and St. Charles Cabinets in the kitchen. This Art Deco masterpiece may have needed a renovation but the “bones” were visible if a potential buyer cared to look. The staging work involved editing, editing, and more editing, having the renter remove everything from the apartment in order to create a clean canvas. My selection of neutral paint colors and suggestion to replace all of the electrical receptacles and light switches in the residence instantly created an image of freshness. As the seller had a budget to fully stage the residence, rental furniture and elegant accessories provided the additional sparkle. Once attractive, stylish furniture pieces were in place, buyers began to feel the beauty of the apartment’s Emery Roth-designed layout. What made this a “staging success” was how quickly the staging turned a property that was “stale” into a sale. Within one week of the staging, the seller received multiple offers close to the asking price. My approach to interior design and home staging is based on my overall design vision and philosophy behind my brand design recipes, determining how a potential user needs to live and function in the space, while also creating an environment that is aesthetically pleasing and always incredibly beautiful. 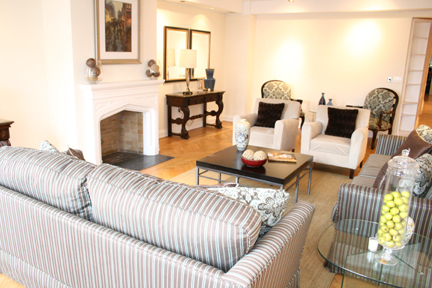 Luckily not only did brokers return to see the apartment after the staging, but so did buyers. In fact, one of the offers on the residence was from someone who had previously viewed the property. Staging helped to polish this pre-war gem, so that potential buyers could finally see all this spacious apartment had to offer from the moment they walked through the front door. Five-time Emmy award-winning television personality Cathy Hobbs is the founder of Cathy Hobbs Design Recipes™, a New York City-based firm specializing in interior design and home staging. A nationally known design expert, Cathy was a finalist on Season 6 of HGTV’s hit reality series Design Star. 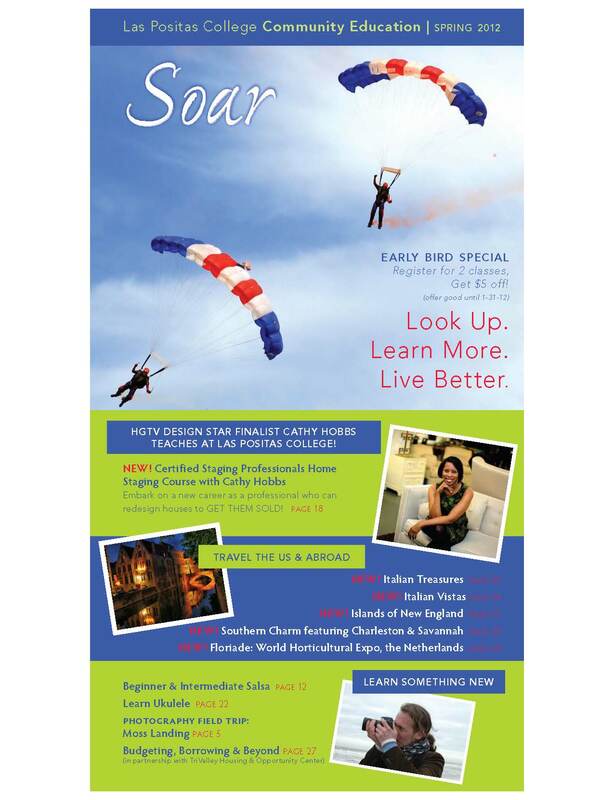 Cathy is currently traveling around the country as an instructor for Certified Staging Professionals, teaching their prestigious 3-day certification course. http://www.cathyhobbs.com. 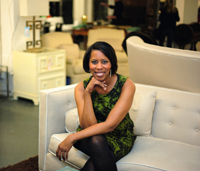 HGTV Design Star Finalist Cathy Hobbs is bringing her home staging course to the DC-area this month! The Certified Staging Professional™ workshop is an intensive, comprehensive program taught through hands-on interaction, group exercises, role-play and in depth practical application of work samples geared to prepare the participants to enter the staging industry with the confidence and experience necessary to succeed. November 30th – December 2nd HOW: To sign up for a staging class with Cathy Hobbs please visit www.stagingtraining.com or call 888-STAGING. I was able to get an exclusive interview with the designer to learn more about her background. Read more after the photo! HGTV Design Star Finalist Cathy Hobbsis bringing her home staging course to the DC-area this month!The Certified Staging Professional™ workshop is an intensive, comprehensive program taught through hands-on interaction, group exercises, role-play and in depth practical application of work samples geared to prepare the participants to enter the staging industry with the confidence and experience necessary to succeed. Q: How has your experience in broadcast news influenced your experience in interior design? I was in broadcast news for 19 years, and in television especially, it’s all about the visuals.. telling a story with pictures. Having this background as really helped me tremendously with my interior design. First, it always allows me to be able to step back and truly visualize a space and focus not only on the big picture, but the fine details as well. Interior design is at it’s core, visual, so my background in television has truly helped a lot. 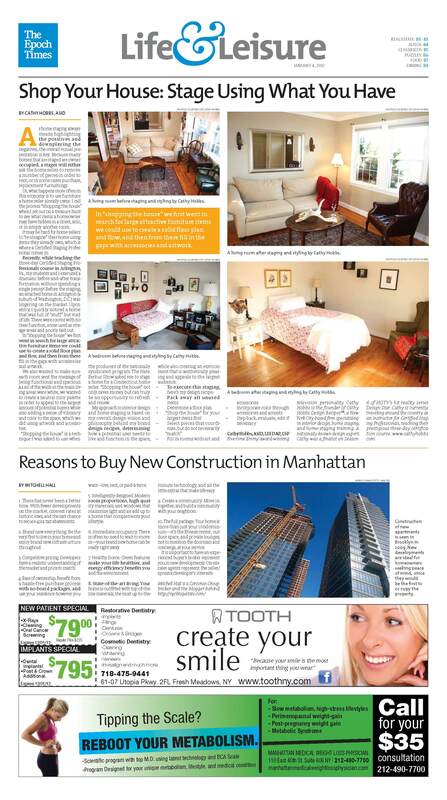 Q: You are the first Green Home Stager in New York City. How important is sustainable design in NYC, compared to other cities? I am not sure New York City residents are more interested in sustainable design, but it is definitely a trend here. Beginning in about 2006 as new development condominium buildings were being built, many developers were looking for sustainable options, such as using recycled materials, having green roods, even down to the selection of fixtures for the bathrooms and kitchens. Much of my business is focused on new developments in New York City, designing common spaces such as lobbies, children’s rooms and gyms as well as model residences. So when my clients were looking for green alternatives, I was the company selected because of my LEED credential. Q: What do you see as the biggest mistake that homeowners make when decorating their homes? Solution: Eye level is at 5 feet. The center point of a piece of artwork should be hung at 5 feet above the finished floor. Adjustments up or down a couple inches may be needed but I consider this to be my general rule of thumb. Solution: I tend to always leave my ceilings white, in order to help visually raise the height of a room. While I am not completely opposed to painting a ceiling a color, people often fail to realize that a painted ceiling automatically visually reduces the height of a room. I recommend painted ceilings only if one if looking to create a certain mood or sense of coziness. Solution: I love color! And love using color, but as a general rule of thumb I tend to encourage people to design with (1) neutral color to be used a general wall or fabric color for upholstered pieces and then to use (2-3) accent colors that can be incorporated into accessories such as pillows, area rugs, artwork, pottery and vessels. I also remind clients that is o.k. to create a design scheme, using shades and tones of the same color. Solution: As basic as this may sound, so many people fail to measure and even loosely create a floor plan before purchasing furniture. I can not tell you how many times I have walked into rooms overstuffed with furniture..or pieces that are just to large or too small for a particular space. I suggest that before shopping always create some sort of floor plan even roughly on graph paper ..counting the squares in order to create your own scale, so that you know in advance whether or not a particular piece of furniture will fit. Problem: Purchasing “sets” of furniture Solution: I find that purchasing the “5-piece” set, seldom results in a successful interior design solution. Purchasing sets tends to make a space look like a showroom instead of a home. I believe beyond bedroom sets, in which I tend to suggest clients purchase only lets say a bed, nightstands and perhaps (1) case good such as a dresser, purchasing “sets” are a no no. I believe it is a far better option to purchase one main primary, solid quality, well designed piece of furniture, and create a design scheme around it. Q: How essential is quality home staging when putting a house on the market? A staged home has great appeal, enticing buyers inside, where they will see the best view of each room and the best traffic pattern throughout the home. Further, a staged home is also in its best showcase, mint condition, so that it sells at the best possible price in the shortest possible time, an un-staged home does not. Staging before placing the house on the market, even before the “broker tour,” is ideal because realtors, as much as potential buyers, want to be “wowed”, and will be! A staged house will stand out from the competition. Realtors will want to show it to their clients, increasing traffic to your listing and speeding its sale. Q: We love your Design Recipes! What inspired the idea? Thank you! I invented Design Recipes based on my overwhelming desire to make my designs approachable and affordable. I was inspired to become an interior designer based on the fact that when I was a young reporter coming up I was virtually making no money. I shopped in thrift stores and at flea markets and would go on wonderful treasure hunts for furniture and accessories! I would have loved to be able to have the advice or tips from a professional designer without the big price tag. That’s what design recipes is all about providing practical, affordable tips that any design enthusiast can apply to their own home. Design Recipes feature a room on the front with the “ingredients” of how the room came together, similar to recipe instructions and on the back is all of the resource information! Design Recipes the website www.design-recipes.com has also expanded to include free recipes, a blog, design tips, videos and will soon feature podcasts. More than 300 recipes are available on the website. Home Staging Event with Cathy Hobbs and Tui Lifestyle New York, NY – Nearly 150 people poured into 20 Pine The Collection for a one-of-a-kind home staging event last week. The Financial District’s (FiDi) premier condominium, now nearing 95 percent sold, collaborated with Season 6 finalist of HGTV’s reality show ‘Design Star’ Cathy Hobbs and Miami-based designer and retailer Tui Lifestyle for this unique event. Guests enjoyed delicious treats from La Maison du Chocolat and fare by Mexicue – the popular Mexican barbecue food truck that was a finalist in the 2010 Rookie Vendy Awards – as they toured two new beautifully designed model homes created by Tui Lifestyle. “We were thrilled to team up with Cathy Hobbs and Tui Lifestyle, two of the most influential names in the design world,” said Lori Ordover, managing member of The Ordover Group, sales and marketing consultant for Africa-Israel USA, developers of 20 Pine The Collection. “The event was fantastic, with guests taking in valuable tips and being the first to see our new models.” Guests were wowed by Tui Lifestyle’s luxury turnkey packages featured in home 1912 – a 666-square-foot studio comprising 219 square feet of outdoor space listed at $855,000 – and residence 1913 – an 817-square-foot studio with 268 square feet of outdoor space, on the market for $899,000. The first model was outfitted with Tui Lifestyle’s Innovative 2011 with Thai Outdoor (in white) collections, while the second featured the Luxe (in grey) with Thai Outdoor (in brown) collections. Following the tours, during a highly anticipated presentation, Hobbs provided tips on the use of color (“Don’t be afraid to use the color white, it’s a great backdrop and you can choose any accent color,” she said) as well as different methods and benefits of staging a home to give a potential buyer an idea of what rooms can be used for. Owners should stage homes to portray a lifestyle image, she noted; it’s not enough to just furnish it nicely. At the end of the night, attendees walked away satiated – both in knowledge and food – and loaded with $50 gift certificates that encouraged further feasting at the upscale FiDi steak and seafood eatery, Capital Grille. Warburg Marketing Group, a leader in luxury, residential condominium sales is the exclusive sales and marketing agent for the property. Offering by Prospectus only. File NO CD05-0163. Equal housing opportunity. As a television news reporter and anchor for nearly 20 years, I told stories for a living. I covered and reported the news in some of the top local news markets in the country. In many ways, the storytelling techniques I used during my decades in news are the same skills that can be used to tell a story when it comes to home staging and styling. In creating “the story” for any property, you want to make sure you are creating a marketing tool that will appeal to a targeted potential buyer. Most buyers need to have an emotional reaction to a property and that is what your story should convey. In a recent project, in which I was staging a model residence in an urban area of Brooklyn that appeals to couples and families, I settled on a design recipe that included a travel theme. In designing, I never select the route of a literal interpretation; instead, it is all about design and subtle touches that I hope work seamlessly together. The thought behind my design recipe related to the fact that I believed the target resident would be a couple, mid to late 30s, and well traveled. I further envisioned this couple as one who considered their travels a big influence to their design and decorating tastes. In the living room, I selected luxury materials, including a walnut lounge chair with a black leather cushion and seat, walnut wood dining table, and black walnut trimmed “schoolhouse” style chairs. I also added unique accessories such as a candleholder made of cold rolled steel and a woodcarving art piece carved from white lacquer. As with all of my projects, I wanted to tell the “story” of the space, and in this case, the story involved the merging of modern luxury with industrial elements. I wanted to tell a story as well in designing the sales office, which is where potential renters make their first impressions of a property. In this space, I felt the story should be more of one of “unbridled luxury,” which I translated into an equestrian design theme. Since I began riding horses at the age of 8 and owned a horse until I went to college, I can relate to many aspects of the equestrian design theme. In keeping with this design, I selected an oversized, dramatic acrylic three-panel art piece that really anchored the space and served as a focal point. I then grounded the space using color by selecting a sectional sofa in rich charcoal flannel, adding sumptuous custom-made toss pillows in a ribbon pattern similar to the reins of a horse’s bridle. My approach to interior design and home staging is based on the philosophy behind my brand Design Recipes: determining how a potential user needs to live and function in the space, while also creating an environment that is aesthetically pleasing and always incredibly beautiful. Cathy is currently traveling around the country as an instructor for Certified Staging Professionals, teaching their prestigious 3-day certification course in Arlington, Va., Miami, Boston, Columbia, Maryland, San Francisco, Fargo, N.D., Nashville, Los Angeles, Philadelphia, Long Island, N.Y., and Las Vegas, Nev. 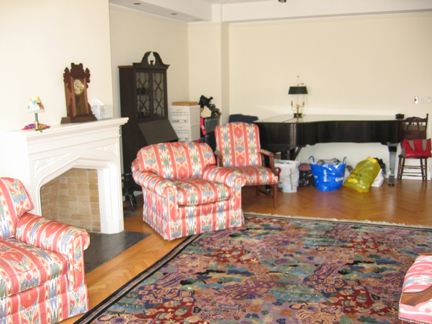 Contact 888-STAGING or www.stagingtraining.com to learn more.